When it came to selecting members for the Wahl Style Team, Diana Carson must have been a no brainer. For not only was this mens hair guru crowned American Crew Mens Hairdresser of the Year, she’s also been a finalist at the British Hairdressing Awards and L’Oreal Colour Trophy. A key member of the Rainbow Room International Artistic Team, Diana has worked on numerous hair shows and shoots, from London to LA, including London Fashion Week Mens. Having worked with the renowned Scottish salon brand since 2008, Diana has become an expert in everything from colour placement to technical cutting. She is also a qualified educator and teaches other hairdressers at seminars within the Rainbow Room International Academy. In addition to joining the Wahl Style Team, this year Diana was also announced as one of 12 Schwarzkopf Professional Collective Members – an exclusive team of digitally-active Schwarzkopf Professional hairdressers from the UK and Ireland, all of whom produce beautiful, relevant and engaging social media, helping establish her as the next generation of hairdressing influencers. We can’t wait to what amazing imagery she’ll produce for Wahl. 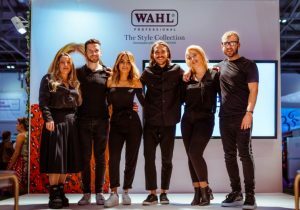 To find out more about the Wahl Style Team line-up click HERE.